It was a reunion between uni-mates – my husband hadn’t seen his friends in years. 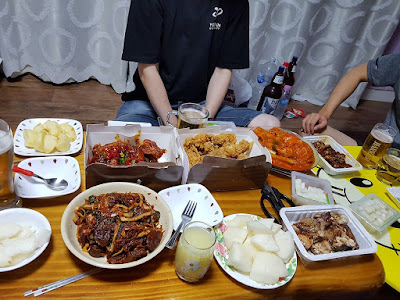 We had a feast of chicken, both seasoned and fried, tteokbokki (sticky rice cakes) and sundae (stuffed blood sausages) at his friend’s home after an entire day out in the outskirts of Seoul. Gatherings in Korea just do not stop at dinner. It’s common to go for coffee, dessert or more drinks as a “second” round and it’s followed by many other rounds. Our plan was to sneak away for a drink and noraebang (karaoke) session when the children were asleep. We coaxed Elise to sleep and everything seemed perfect. 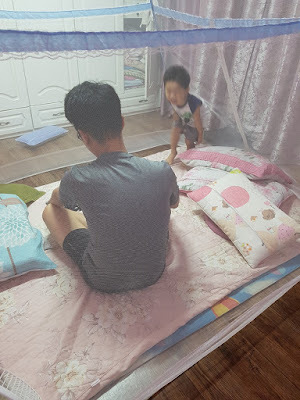 My friend’s wife volunteered to watch the children “Just go and have fun. If she wakes up, I’ll call you. Don’t worry”.Closing the door behind us, the four of us strolled along the neighbourhood towards a small watering hole. The cool night breeze, the lights and sounds of the night. I felt like I was 15. We only had time to sit down and browse through the menu – “Should we order the assorted pancakes or the seafood pancakes?” before the call came. We rushed back, taking the way we went, this time at an urgent pace. Before we even opened the door, we could hear her wails. The walls of mom-guilt collapsed on me. How could I even think of leaving her in a place unfamiliar to her for a night of fun? Her cries were that of fear, her nose was runny and she was inconsolable. My friend’s wife explained that she had been crying for 10 minutes. 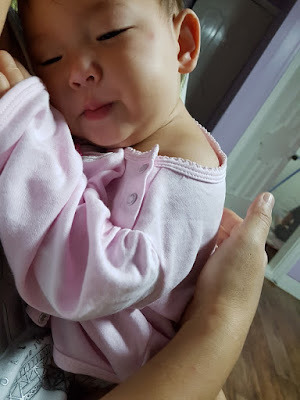 She immediately lurched into my arms, crying and clutching my top with her tiny fingers. Hugging her close to my chest, I felt her racing heart regain its normal beat and her sobs turn into sniffles. I didn’t get to go for my noraebang session, but I learned a lesson that there’s a time for everything. One day, she won’t need me as much as she does now. Until that day, she is my priority.